Dynamic-FX are special dynamic fills that can be used for motion menu with Render Motion. First you need to select any object on menu, for example Text and then apply Dynamic-FX. There are number of pre-sets and few parameter settings that change the look of the dynamic fill. However the Dynamic-FX are best used with motion menu. As in the preview in the Dynamic-FX window, the effect changes with time that can be rendered using Render Motion to a MPEG-2 file. Plasma, Smoke, Fire - this type draws the texture inside the object, like a dynamic texture fill. 3D Dots/Fire rotates the object within its rectangle and shows a trail. This is the only type of Dynamic-FX that doesn't work as fill because it changes the shape of the object. For best result the object has to have enough empty borders around the active area. Bumpy Light will put a light that moves around the object in various directions. Picture RotoZoom will use the existing object texture or fill to tile it and zoom it within the object. For more tricks you can use Mix amount slider or Mix Mode. Both will change the way how the original object is mixed with the dynamic texture. For details on Mix Mode see blending modes. 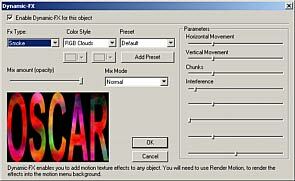 Note: The Dynamic-FX effects should be used to "spice-up" the motion menu, not as the main tool. A good menu must be easy to read and navigate.